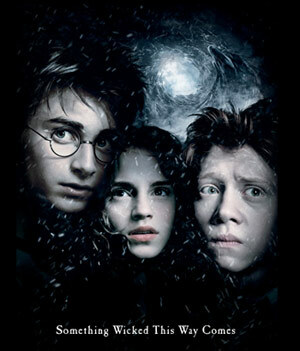 Of the three Harry Potter movies thus far, Harry Potter and the Prisoner of Azkaban possesses the strongest John Williams' soundtrack, the most expansive and spectacular visuals (that new castle is breathtaking), the darkest and most captivating cinematography (the grain of the film is beautiful), and the hottest Hermione yet. Wait, how old is she? Oops. Strike that last comment. The adults are still mostly incompetent (perhaps that's part of the appeal of these stories to children?) and the child acting is occasionally terrible. If you were contemplating pulling a Jack Grubman by trading a favorable rating on AT&T to have Sanford Dumbledore put in a good word for your child at Hogwart's, I'd think twice. It's a wonder more kids aren't seriously injured or killed, the supervision at that school is so loose. Those quibbles aside, Rowling processed through Filter > Alfonso Cuaron > 75% is a beautiful effect. Save that adjustment layer (I'm not nearly as certain about the Newell filter). Cuaron's building an another impressive oeuvre of movies about two guys and a girl. I haven't read the book, but living in a Harry Potter world, it was simple enough to get an exhaustive debrief on every Potterthology reference I missed. Apparently, this is the least faithful of the three movies to date in transferring plot from page to screen. But then, that's what kids do when they reach their teens. They stop taking everything so literally, and the real fun begins.